January | 2012 | Beer Apprentice - Craft Beer News, Reviews, Interviews and Info. Hello again guys. For today’s craft beer review I have one of the most talked about beers in craft beer”dom”…. or at least in my part of the country anyway. 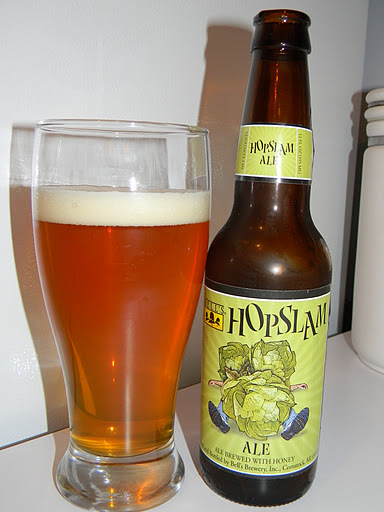 I’m gonna be trying the Bell’s Hopslam produced by the Bell’s Brewery, Inc. located in Kalamazoo, Michigan. This is another one of those brews that really needs no introduction, so let’s just get to the website, bellsbeer.com, and see what it has to say about this very special beverage. I can’t wait. Let’s drink up. The Hopslam comes in a 12 oz. bottle and has an ABV of 10.0%. The beer poured a clear, gold to orange color with some burnt orange highlights showing at the bottom of the glass. The white collar was kind of small, but it was smooth, creamy and soft by way of texture. It consisted of small, tight and compact bubbles that held a decent retention time and left behind some pretty darn good lacing as I tilted the glass from side to side. The nose brought about a huge burst of citrus notes. Very potent grapefruit and orange citrus along with other assorted tropical fruits. It smelled very floral, fresh and bright. Solid hints of pine mixed with a light sweetness from the honey and minuscule tones of caramel. With deep whiffs I could ascertain a slight “clear” alcohol redolence, although it was nothing that got in the way or ever became a dominating fragrance. Overall, the nose was a big, tropical fruit juice bomb. The taste let loose a ton of hops and bitterness. Almost an overload of tropical fruit juices. Grapefruit, orange and pineapple. 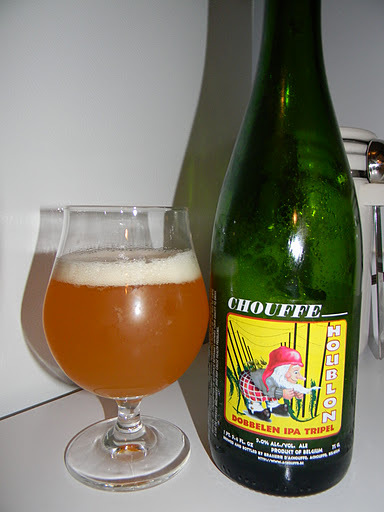 Very clean and fresh flavors congruently meshed with pine needles, light touches of honey and candied sugars. It was rather sweet I must say. The alcohol was noticed somewhat, however it became obsolete after about the first three sips. There is no denying that Bell’s wants you to concentrate on the hops with this one. The mouthfeel was a very sturdy medium. It produced a slight bite, but otherwise it was chewy, sticky, very dry, crisp, snappy and refreshing. The carbonation was fine and it contributed a noticeable amount of warmth at the back end in conjunction with more than enough flavor left on the palate between sips. Well. What else do I need to say? If you love big, hoppy beers, you need to get your hands on a bottle of this. I think you would find yourself in hop heaven. It presents enough aroma and flavor to satisfy any hophead that’s for sure. Not to mention the fact that it is super easy to drink. Watch out though!!! 10.0% ABV will sneak up on you in a hurry if you are not careful. I was taking huge gulps and had to continually remind myself to slow down and take it easy. This is definitely a beer that I look forward to every year and will continue to pick some up each time a fresh batch rolls around. Personally, I think it ranks up there with some of the better IPA’s that are on the market. Now, I’m not saying it’s better or more satisfying than say… Three Floyds Dreadnaught, Founders Double Trouble or Stone Ruination (I’ve never had Pliny, so I can’t speak on that one), but it definitely needs to be mentioned in the same breath as those brews. Obviously, I would recommend this beer to anyone, so if you are lucky enough to get your mitts on a bottle of Bell’s Hopslam, give it a try and see what you think. I doubt that you will be disappointed. Thanks for reading and commenting folks. I appreciate all of you guys. Hi guys. For today’s craft beer review I’m going to be trying a Fort Collins 1900 Amber produced by the Fort Collins Brewery situated in Fort Collins, Colorado. It’s been some time since I last had a Fort Collins brew and I’m starting to get thirsty, so let’s get to the website, fortcollinsbrewery.com, and see what they have to say about this Lager. 1900 is a nod to the very things that got us where we are today – crisp, clean microbrews all from the belly of a little brewery tucked away in the outskirts of Old Town. The result is a superbly refreshing, bright and delicately balanced amber lager. This brew has an ABV of about 4.5% and it comes in a 12 oz. bottle. It poured an orangish/amber color with some burnt yellow highlights around the curves of the glass. It had a very small, off white head that was a bit soapy in texture. Very little retention time was had (it was gone pretty quick actually) and the lacing was very scant. Overall, it was mostly clear with a smidge of chill haze initially. The nose on this beer had a bit of caramel malt with touches of toasted biscuit and grain. Some wheat bread characteristics were also noticed. It was lightly floral with an herbal to slightly dank smelling hop profile. Not a whole lot going on with the aroma. It was balanced ok, but it wasn’t overly complex or robust. The taste brought forth some caramel and toffee malts. Somewhat sweet with toasted bread crusts and baked biscuits. It seemed a touch grainy too. It was lightly hopped with just a smattering of bitterness. The taste was mostly clean and earthy, however like the smell, it wasn’t very complicated or forceful. The mouthfeel was a medium to medium/thin. Smooth, crisp, clean and snappy. It was a tad bit watery and not a lot of flavor was left behind after the sip. Well. This was an ok beer I guess. I can’t say that it was anything outstanding, although I never found anything out of the ordinary or off putting. It was very easy to drink and would make for a decent little session brew, but I probably wouldn’t seek this out to share with friends. I mean sure, if it was offered, I would drink it again. I’d say if you see it, give it a try, but don’t go out of your way to find it. 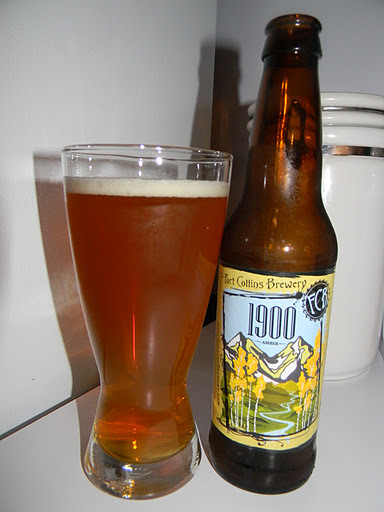 With that said, if you do try or have tried the Fort Collins 1900 Amber let me know you interpretation of the brew. Thanks for checking back in on another review. I really appreciate it.